Can Fantasy Basketball be the New Fantasy Football? Fantasy Football has a long history of creating interactions with its fans, and has played a major role in bringing fans, both young and old, together as they go about their life long dreams of creating a championship dream. Having started out of a New York hotel room, to gaining traction within the technological age of computers, Fantasy Football has broadened the world of Football to many. That being said, one must ask, “Is Fantasy Football the practical fantasy sport?” Some people believe that other sports can provide the same thrill that Fantasy Football provides, however, sports like Baseball, Hockey, or Major League Soccer, either have a season that performs 5 out of 7 days a week over the course of 6 months, or lack the nationwide publicity that enhance the enjoyment of fantasy sports. Nevertheless, there is one sport that has the chance to perform just as well as Fantasy Football, and that is Basketball. Basketball is an up and coming sport that can alter the way fantasy sports interact with fans not only in the United States, but throughout the world. The NBA has a strong connection to numerous places such as, Canada, England, Spain, and even Africa. 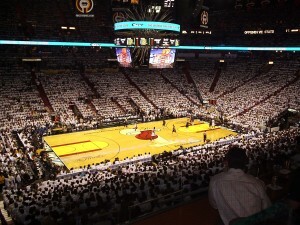 The NBA fan-base surpasses that of the NFL, and this is evident through the NBA’s program “Basketball without Borders”. Furthermore, the stars in the sport such as LeBron James, Kobe Bryant, and Stephen Curry, are athletes known worldwide. Thus Fantasy Basketball would be the next ideal fantasy sport, because of the popularity of the sport worldwide, and the famous athletes that are in the sport. Although Fantasy Basketball may have a strong following of people, the next question then concerns the legality of it. Fantasy sports in general have significant legal hazards that could occur, but Fantasy Basketball would have several risks. Some of them include questions concerning what states could participate in Fantasy Basketball, whether or not minors could participate in leagues for money, and what type of relationship they could have with fantasy league developers such as FanDuel, or Draft Kings. These legal issues, however, could be handled if the NBA were to follow the same standards as the NFL, where there have been limited to no legal issues. With the NBA’s popularity and the formula already established with the NFL and Fantasy Football, the only problem that remains is whether or not the length of the season would hinder the amount fans wish to participate in Fantasy Basketball. To handle this issue the NBA could host “Fantasy Basketball Weekends” or make the point system high scoring to enhance the entertainment value. The NBA is primed to take advantage of the stage that Fantasy Football has provided. Considering the fact that the NBA has world-wide fan base, superstar athletes, and the ability to follow a successful standard established by another sport, offers the NBA has the ultimate opportunity to become the next successful fantasy sport.